Lara Hanlon is a designer, design thinker, explorer, and maker. As Designer in Residence at IBM, Lara collaborates daily with global teams to envision and contribute to design practices, culture, and education at scale. Lara also lectures in Design Thinking at Dun Laoghaire Institute of Art, Design + Technology (IADT); and is the sustainable food enthusiast and researcher behind éntomo – an online platform that promotes the consumption of edible insects! 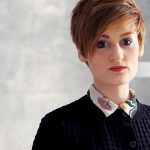 You will find Lara frequently dabbling in generative design, storytelling and public speaking – exploring topics that range from the business of design to food to computational typography. Lara has delivered talks at TEDx; The Future event; National Digital Design Conference Pakistan; Bulgaria Web Summit; and OFFSET Dublin. She has facilitated design thinking workshops at IxDA 2016; National Digital Design Conference Pakistan; and UX Camp Dublin 2017. Her work has also been exhibited at Milan Design Week; selected by 100 Archive; featured by Offscreen Magazine; and published by Bloomsbury Publishing.